Remember penny candy? 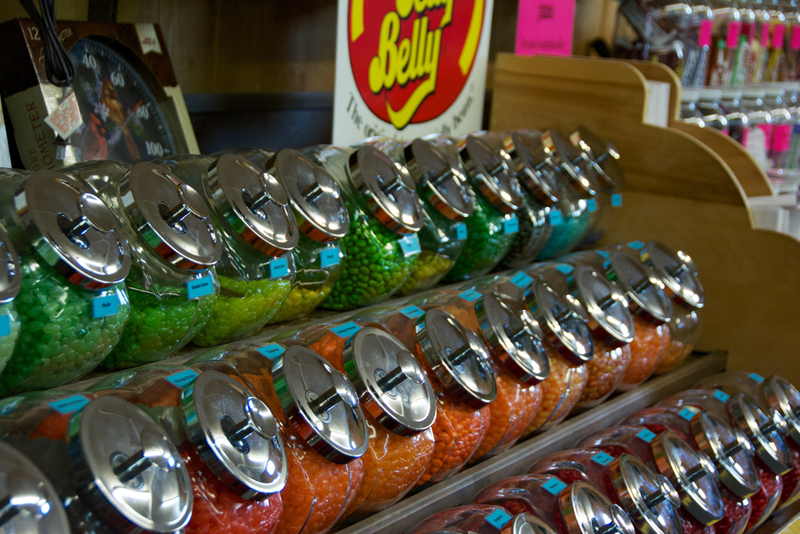 Some of us are old enough to remember when “penny candy” actually cost 1 cent. Sadly those days are gone, but fortunately the candy itself isn’t. 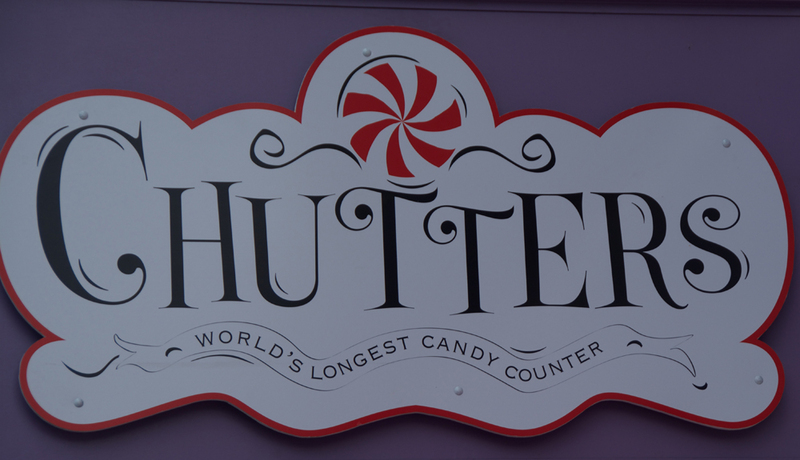 As a nice bonus due to a 2-week visit by our daughter, Jamie, and youngest grandson Connor, we recently had an opportunity to visit a store that was recognized by Guinness as having the “World’s Longest Candy Counter”, Chutters in Littleton, NH. Connor had visited the store with us on a trip a few years ago and returning to his nirvana was high on his list this year. Now Littleton, NH isn’t what you would think of as a thriving metropolis. But if you were to think about a quaint New England town, you’d be in the right ballpark. When you walk up to the store its in a row of other shops that are typical of a small-town main street. 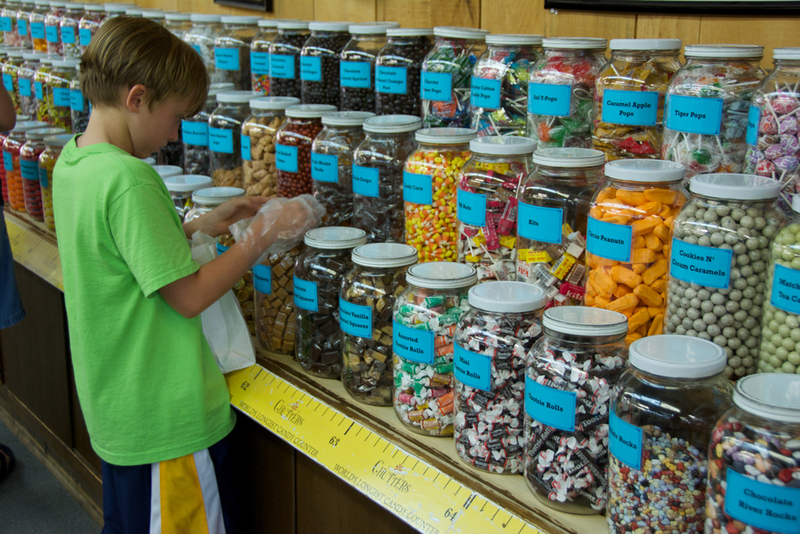 Entering the store you’ll immediately see he candy counter on your left, which runs the entire 112 foot length of the store. At this point you’ll be recalling some long-lost memories of your childhood. How you pleaded with your parents for some money so you could spend it on candy. 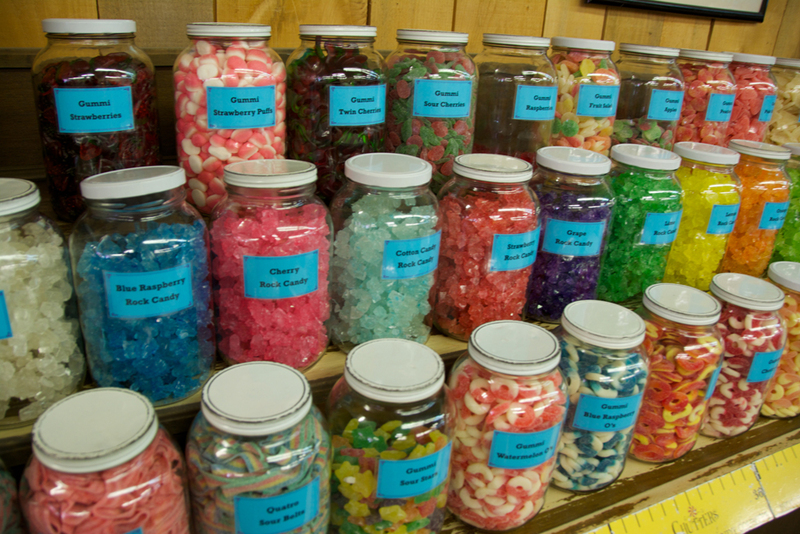 How you would only buy a particular type of candy. 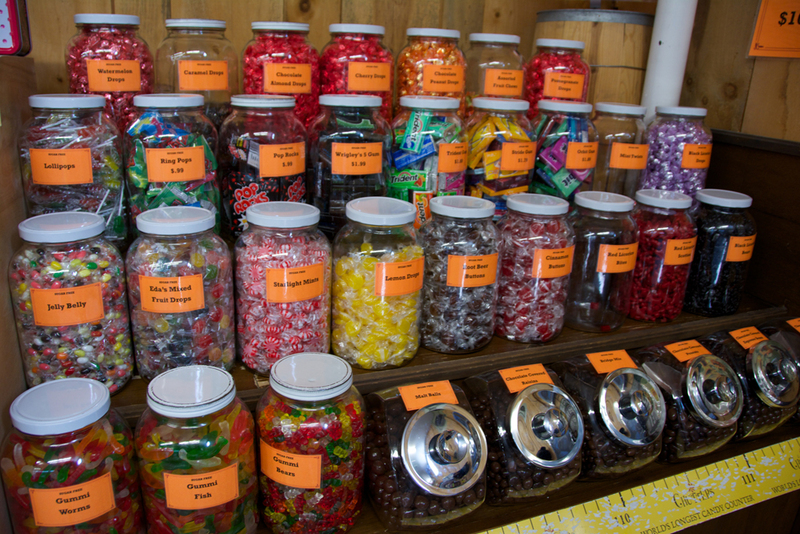 Or how you would insist on a big assortment of candy. 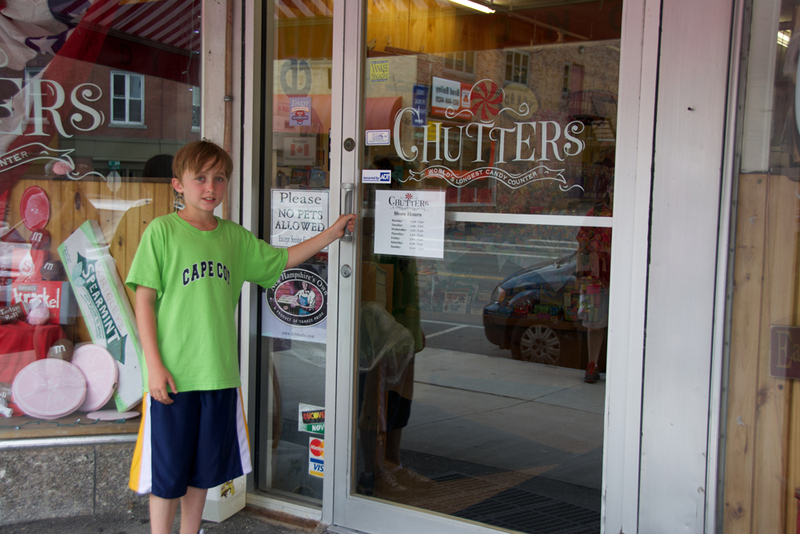 As you visit Chutters you’ll also find yourself saying, “I didn’t know they still made those” a lot. 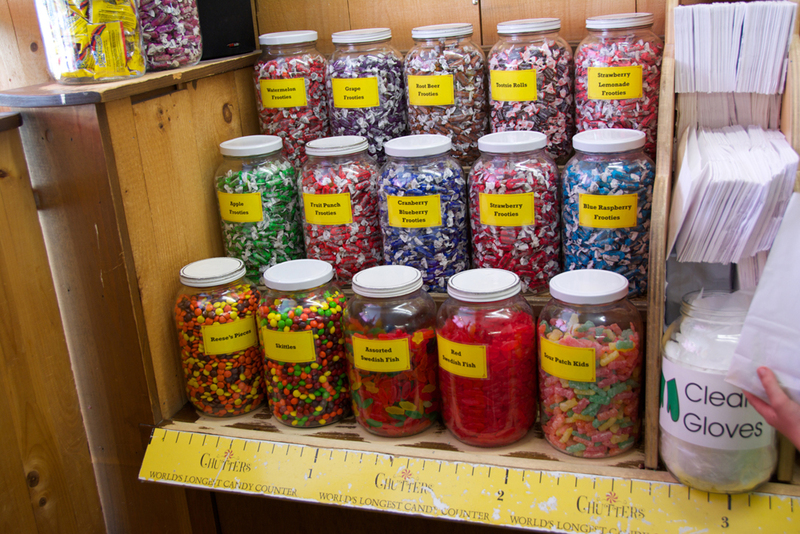 You’ll most likely find every type of penny candy you can recall from your childhood…and many that you had forgotten. 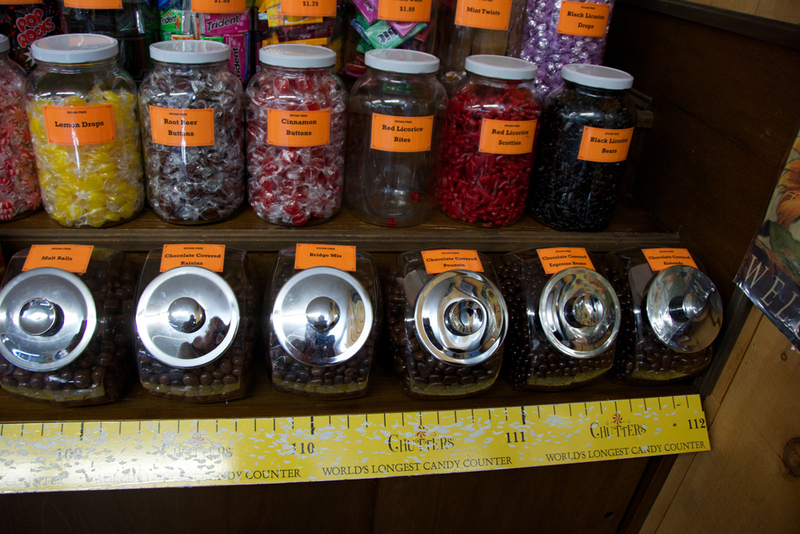 Chutters sells the candy by weight. You’ll find bags (and gloves to keep everything sanitary) strategically located along the counter. 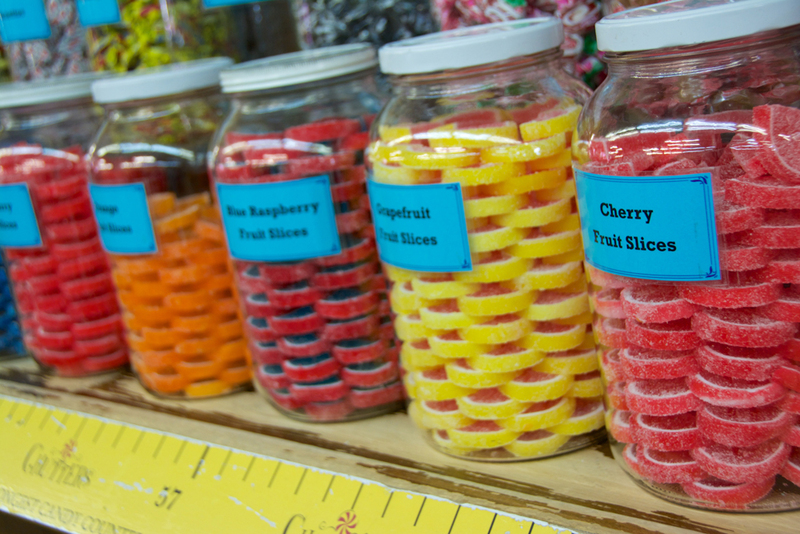 We found ourselves falling into the trap of grabbing “just a few more” and eventually realizing that we now had five pounds of candy! Penny candy isn’t the only attraction here. 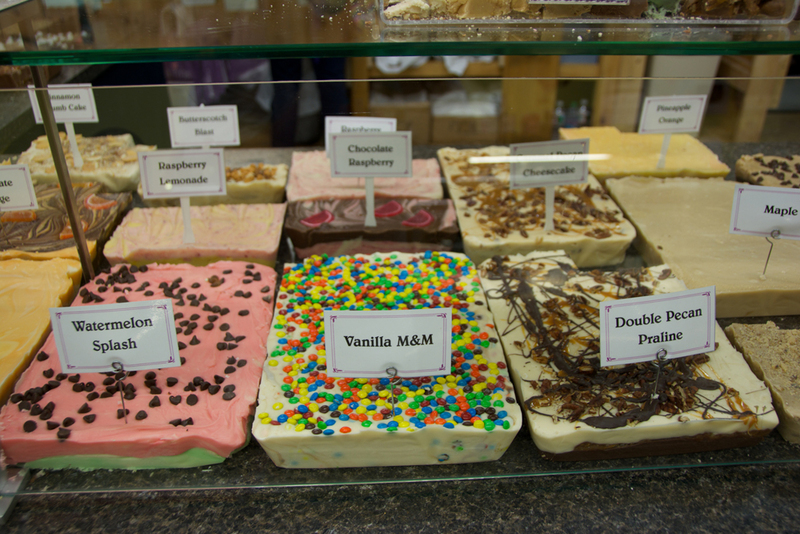 There are other sweets including home made fudge, specialty chocolate and truffles. The fudge ($6.50/half pound) comes in several varieties; Milk Chocolate, Milk Chocolate Walnut, Dark Chocolate, Dark Chocolate Walnut, Maple, Maple Walnut, Reese’s Peanut Butter Cup, Penuche, Penuche Walnut, Heath Bar, Chocolate Cheesecake Swirl, Mounds Bar, Reese’s Pieces, Peanut Butter Chocolate Layer, Peanut Butter, and Double Chocolate. There may also be additional varieties available when you visit. 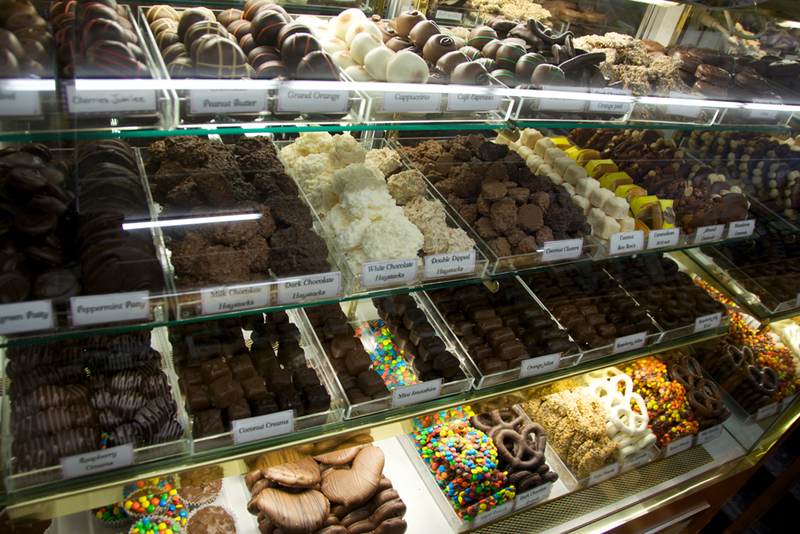 Specialty Chocolates include such delicious options as turtles (in either dark chocolate or milk chocolate), chocolate covered pretzels (milk, dark, white or M&M), . 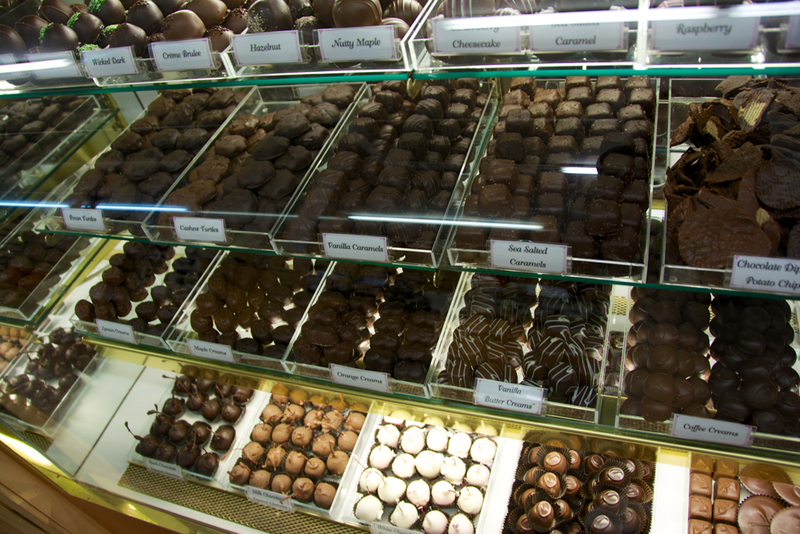 Large truffles (4 for $6.99) come in a big variety of flavors ranging from the more traditional Caramel to some rarer types such as Amaretto Cheesecake. So, are we sweet enough yet? No? Well browse around the unique gift baskets. Several of these come not in a basket, but in an old style lunch box. Options include a tootsie roll box or a Hello Kitty box among others. 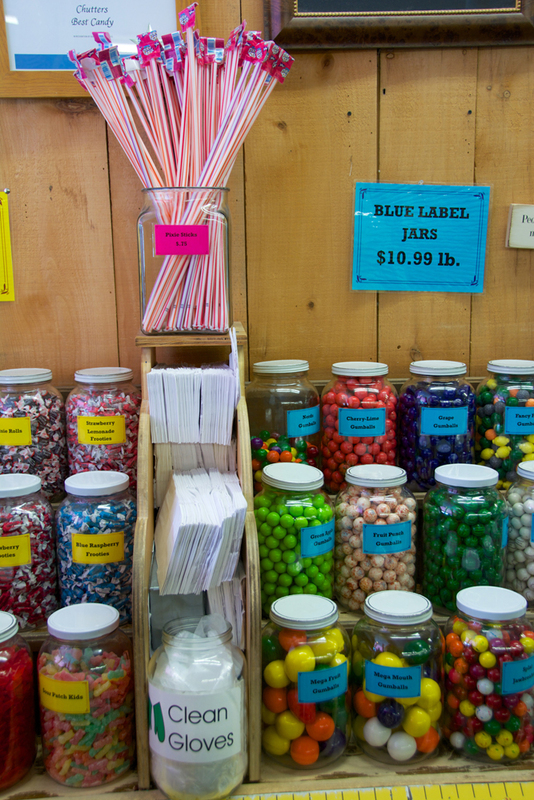 Yes, there are also basket options; taffy or maple candy baskets. Gift baskets run between $40 and $50. 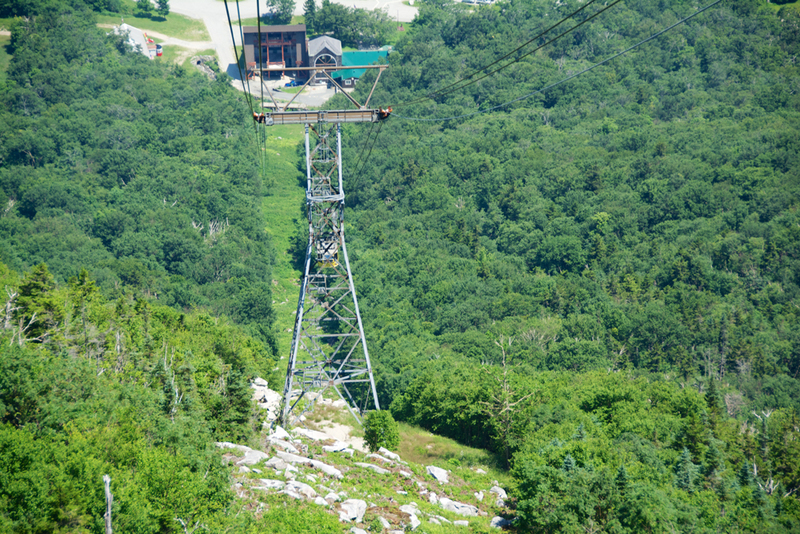 Chutters is located in the scenic White Mountain region of New Hampshire and isa pretty long drive from most major population centers. 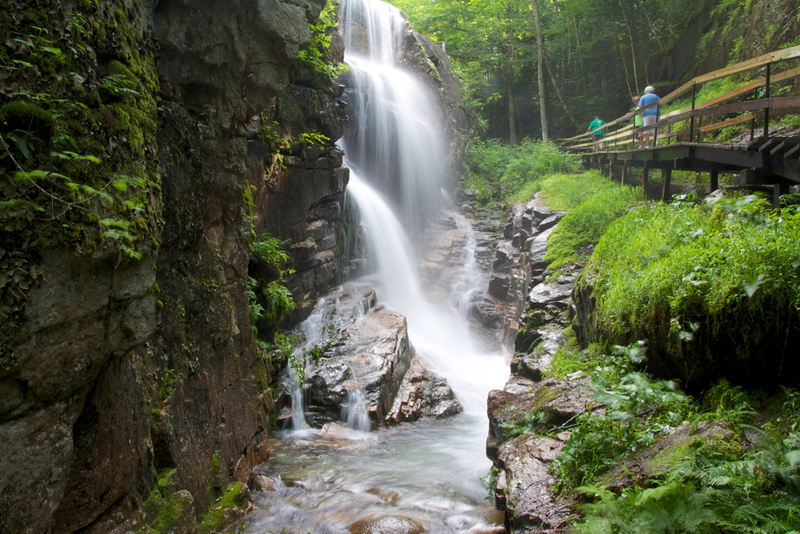 It may not be realistic to go there on a whim but if you make it an overnight trip with stops at some area attractions, like the Flume or Cannon Mountain (http://www.cannonmt.com/flumegorge.html), it makes a very nice get away. The scenery in the White Mountains is spectacular. This entry was posted in Foodie Tales, Foodie Travels and tagged 112 foot candy counter, Amaretto Cheesecake, Cannon Mountain, Caramel, Chocolate Cheesecake Swirl, Chutters, Chutters Littleton New Hampshire, Chutters Littleton New Hampshire World's Longest Candy Counter, Dark Chocolate, Dark Chocolate Walnut, Double Chocolate, Flume Gorge, fudge, gift baskets, Heath Bar, Hello Kitty box, Littleton, Littleton New Hampshire, made fudge, Maple, maple candy, Maple Walnut, Milk Chocolate, Milk Chocolate Walnut, Mounds Bar, New Hampshire, Peanut Butter, Peanut Butter Chocolate Layer, Penny Candy, Penuche, Penuche Walnut, Reese’s Peanut Butter Cup, Reese’s Pieces, specialty chocolate, taffy, tootsie roll box, truffles, turtles, White Mountain region of New Hampshire, World's Longest Candy Counter by Jeff Alves. Bookmark the permalink. Jeff Alves is a life-long resident of Plymouth, MA. He and his wife Valerie are currently planning a move to Florida now that Jeff has retired. Jeff and Val are from two very different parts of the country and first met at Walt Disney World. They share a love of all things Disney and enjoy great dining experiences.